Tired of not understanding how others think & act? Feel like your emotions are all over the place sometimes? Confused about what comes next in your life? Not confident enough to strike up a random conversation? 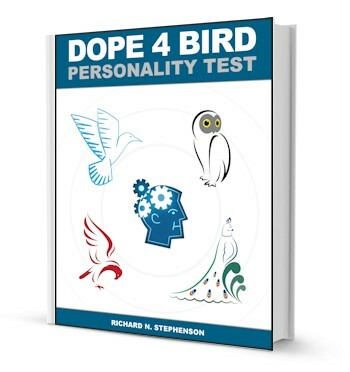 The DOPE Bird Personality Test will help you peek inside for what matters most. You will grow your self confidence and motivation by understanding yourself and those around you. This test and workbook aren’t for everyone. Those who won’t invest a focused 1 hour or so figuring out their personality and how it can change their lives won’t be interested. Over 834,076 people have changed their lives with this test. The real question is: who couldn’t use more clarity, direction, and ideas in doing what they do? You can access your products immediately after purchase or at any time by the link in your confirmation email. Download the book, take the test, digest the workbook, and if you don’t feel as if you’re looking in the mirror, a mirror that reaches beneath your skin and shows you who you really are, then simply send an email through the contact form and you’ll get a full and prompt refund.